DVDs are becoming all but obsolete, thanks to the likes of Blu Ray and online streaming. But their cheap optics may find new life, as scientists have turned a commercial DVD player into a laser scanning microscope, capable of testing for HIV on-the-spot. This device, conducted by a team led by Aman Russom, senior lecturer at the School of Biotechnology at KTH Royal Institute of Technology in Stockholm, converts the DVD drive using what is called a "Lab-on-DVD" mechanics and provides far-reaching benefits for health care in the developing world. 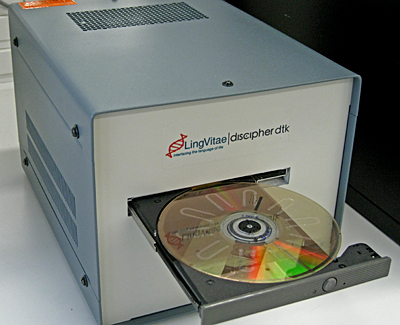 This was tested by successfully collective CD4 cells and visualising them using this reader. The laser optics can analyse blood and perform cellular imaging with one-micrometre resolution, presenting a breakthrough of both scientific innovation and value. The standard equipment required for HIV testing, a Flow cytometry unit, can cost nearly £20,000, whereas DVD players are in Argos for a Fiver. And unlike these Flow cytometry units, it's not a bulky unit, making it portable and they don't require significant training to operate. "With an ordinary DVD player, we have created a cheap analytical tool for DNA, RNA, proteins and even entire cells," says Russom. "The low cost of the technology makes it suitable as a diagnostic and analytical tool in clinical practice close to the patient," Russom says. "And because it delivers extremely fast analysis, the patient does not need to go home and wait for a response. They can get it right on the first visit to a doctor." Moral of the story: make sure you don't throw away your old tech, as scientists are breathing new life into them.